Sublime fans, this is a great bumper sticker! 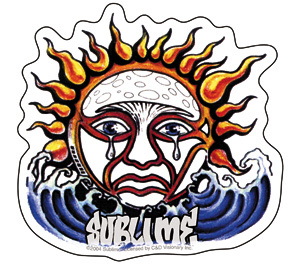 It is the classic Sublime sun logo that is weeping. It measures approximately 4" x 4 1/2" and would look great on your car, locker, wall, wherever you want to slap it on. Officially licensed Sublime merchandise.